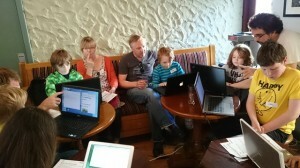 The newest Skerries Community Association committee, Skerries CoderDojo, had a great start to its monthly free computing-club sessions. 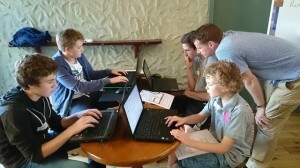 Their aim is to bring interested young people aged 7 to 17 and mentors who have a computing / coding background together. The buzzword here is Digital Literacy, the ability to not just use computers but to understand how they work, and to write your own computer programs. The organisers, helpers, and mentors numbered more than a dozen, and the interest in Skerries for this monthly event is huge. The venue could hold 30 “ninjas” (which is what CoderDojo participants are called) – it could have been filled twice over, and the (free) tickets were snapped up within twenty minutes. 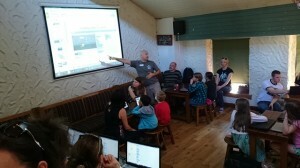 If anybody would like to join the group of mentors / parent helpers / organisers, they can send an email to coderdojo@skerriesca.com. And if you would like to get a ticket for the October meeting, scheduled for Sun Oct 5, 4 p.m. to 6 p.m., then you need to keep an eye on the daily SCA Newsflash email – that, and the SkerriesCoderDojo Google Group (which you are invited to join) is where you will first learn when next month’s tickets are released. Do you think you will be back for next month’s event? – Yes, definitely. – 100%. What was particularly good from your point of view? 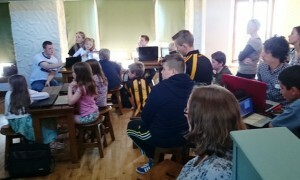 Skerries Community Association is delighted to be helping Skerries CoderDojo to get established and would like to thank all the mentors, organisers, and helpers for their efforts. Best of luck to you for the future!